In high school, everybody wanted to look the same. Elvis was the fashion icon, and we all grew sideburns and dressed to look cool. Many years later, I was at an Orthodox Chassidic wedding, and I realized I was the only person there with a grey hat and suit. Everyone else was dressed in a black suit and wore a black hat. They all looked the same just as my buddies from high school looked the same with their pompadours and pegged pants. The common thread: similar dress indicated similar mindset. To be different branded one as an outsider looking in. Individuality was suspicious. Confirming to the majority is the challenge facing “Z,” the hero of Antz, a hilarious animated feature, which deals with expressing one’s individuality in a world where conformity is the ideal. The narrative begins in an ant colony in Central Park in New York where Z-4195, also known as “Z”, longs for the chance to express himself as an individual. He is depressed over living in a totalitarian society that frowns upon and, in most cases, forbids veering from the norm. Into his world enters Princess Bala who meets Z at a bar to which she has escaped from her suffocating life at the palace. Their union is aborted when the princess suddenly has to leave. However, Z, mesmerized by her, is undaunted by their different positions in society. He gladly exchanges his worker ant status with a friendly soldier ant to seek an opportunity to see Bala again and pursue their relationship. Crisis arrives when the soldiers are sent into battle by General Mandible, the power-hungry leader of the army of ants. Z barely escapes with his life and resolves to seek a better world where individuality is valued. Mandible and Z represent two conflicting ideologies: conformity versus individuality. The worker ants have to choose between the two, or learn to strike some kind of balance between the two. Jewish tradition offers such a balance. Jewish law requires conformity in practices related to rituals and moral behavior. Everyone who is with the program possesses a belief in God and in the divinity of sacred text. Once those basic principles are accepted, then there is room for individual expression. Although everyone is created in God’s image, which means that everyone is unique and possesses infinite value, it is good that not everyone is exactly the same. We should appreciate the differences once common core principles are accepted. The classic model is the Talmudic discussion that takes place between Sages who may see the same reality but use different eyeglasses to arrive at different conclusions. This is exactly what happens to Z when he foments revolution among the worker ants. The powers that be mock him, but Z does not despair. He is convinced that individuality is to be celebrated even when society operates with a totalitarian vision. The key is balance. 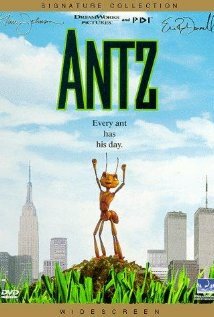 Antz is a wildly imaginative movie with lots of laughs, especially since Z is voiced by Woody Allen, articulating the neurotic pessimism that characterizes his humor. Beneath the surface, however, is a serious statement about preserving the integrity of the individual voice even when the majority wants to drown it out. Posted in Animated film, Comedy, Movie review, Romance. Bookmark the permalink.